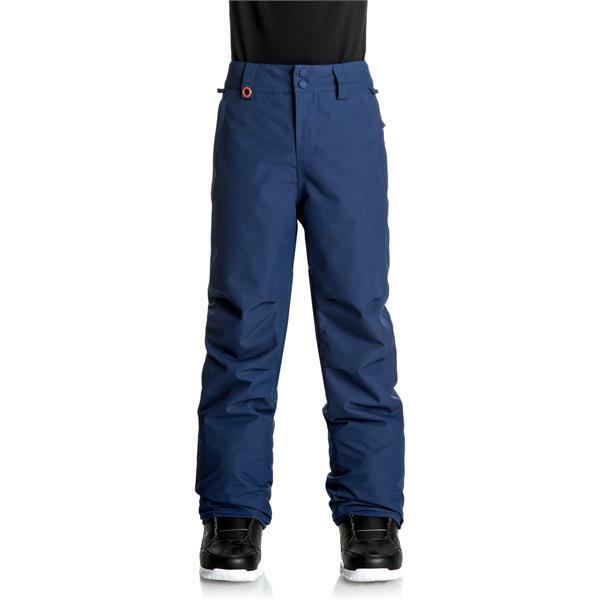 Make sure your child stays comfortable out in the snow this winter with these boys' Quiksilver Estate snowboard pants that are perfect for a day on the slopes or simply playing in the backyard. DryFlight® and WarmFlight® technology work together to keep your child dry and warm no matter what kind of weather comes his way. These pants can be easily adjusted at the waist and attached to your child's jacket to keep the snow out while he tears it up on the mountain. With plenty of colors to choose from, you are sure to find the perfect pair of these boys' Quiksilver snowboard pants for your child this season. Son loves the pants. Very warm. Definitely recommend! Exactly what was described online. Great pants. Very warm and waterproof. My son loves them. these pants fit the bill for my 10 yr old. the size 14 has plenty of room for growth and he finds them warm and comfortable. i'd say these run on the bigger side, which i appreciate. tons of room in the waist, so he needed some help adjusting them so that they're tight enough, but that just means he'll get more wear out of them. velcro adjusters are harder to use than cinch and button elastic, but at this price, who cares? In the size drop down it lists the large as a size 12... but according to Quiksilver’s size chart the large would be a size 14 equivalent. Can you clarify please? BEST ANSWER: The Quiksilver chart is correct.